Whether you own or lease a building or whether you manage your business from your home or your office is your vehicle, saving money is every business’s objective. The best way to save money is to be green. By helping the environment you can also help your work place. So whether you own a multi-story business complex or a small home office, conserving money will help you save money and reduce your expense. Home office or a large commercial complex, you will have to pay for the utility bill. This utility bill includes the cost for lighting, office equipment, heating and air conditioning and even the small appliances which you use. Here are some energy tips which will help you save on utility expense. 1. Use a programmable thermostat: Your office does not need to be heated or cooled when no employees are there. Use a programmable thermostat so it automatically turns the temperature low or high when no one is utilizing the office. 2. Turn off the lights when not in use. Make sure to turn the lights off when no one is using any portion of the office. If you have a larger commercial building, try installing sensors so the room only lights up when someone is present in the room. 3. Use ENERGY STAR equipment: Use ENERGY STAR equipment as it saves you a lot of money on your energy bill. For example ENERGY STAR qualified Compact Florescent Lights (CFLs) consume 75% less energy than regular incandescent bulbs. From lights, fans, office equipment such as printers and scanners to desktops and laptops ENERGY STAR equipment is available and costs you at least 20 percent less in your energy bill compared to regular products and produce low gas emissions so they are green all the way. 4. Reduce the Margins: When printing any document reducing the margins will conserve more paper. Also try buying the recycled paper and help the environment. 5. Unplug: Unplug the equipment which is not in use to avoid the “Phantom Load”. Also try using the power strip and connect all your major electronics such as printer, scanner and copier on it. By turning a switch off you can turn off all your major office equipment and turn them back on when you want to use them. Also it is wise to connect the coffee maker and the microwave on a power strip too. Looking to lower your electricity bill? You can start by swapping out old incandescent light bulbs and replacing them with more efficient CFLs or LEDs. 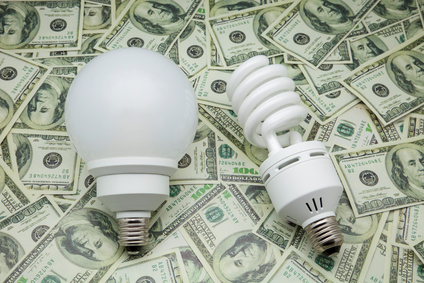 CFLs and LEDs can be up to 80% more efficient than incandescent bulbs, meaning you could be paying 80 cents per dollar less for your electricity when it comes to lighting. Lets look at these efficient bulbs to understand how they are beneficial. Electricity use is measured in watts. 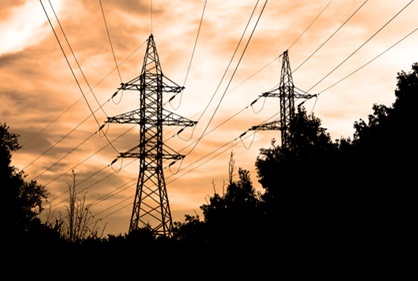 Your bill is tracked by kilowatt hours (kWh), which is 1000 watts used in an hour. Bulb brightness is measured in lumens. A typical indoor incandescent bulb is 60 watts and emits 800 lumens of light. That means every hour it uses 60 watts to produce that light. An LED bulb producing 800 lumens of light uses just 12 watts of electricity. CFLs, or compact fluorescent lamps, are mini fluorescent tubes. They usually look like a curly tube shaped bulb. They are less expensive per bulb than LEDs, but they last about half as long. Incandescent bulbs, depending on how often they are used, can last for a couple of years. CFLs can last up to 9 years and LEDs can last about 20 years. Another way to reduce energy usage in any kind of bulb is to use 3-way or dimmer switches. These types of switches allow you to only generate as much light as is needed. With a standard on-off switch, the light bulb is either using no electricity or the full amount it can use. With dimmer switches, you can use less electricity when less light is required. Furthermore, you can use occupancy switches to turn lights on when they detect movement and turn off when no movement is detected for a while. These kinds of lights prevent themselves from being left on when not in use. 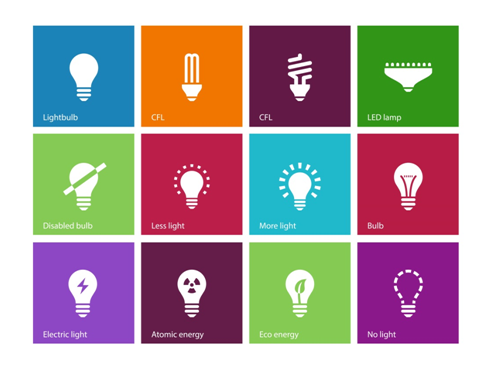 Reducing electricity use in your home can be pretty simple when you break it down by category. The main categories in your home are lights, electronics, water, and climate control. It’s always a good practice to turn off the lights when you leave a room, but if your home has a tendency to leave them on, occupancy sensors can shut the lights off for you. If the sensor doesn’t detect any movement for a set period of time, from a few seconds to a few minutes, it will shut off the lights. Installing more efficient lighting like LED bulbs will also reduce your energy usage. 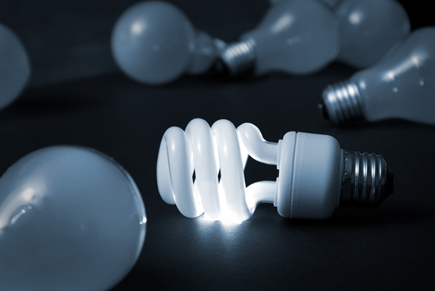 LEDs and CFLS are about 80% more efficient than incandescent bulbs. The only way to stop electronics from consuming electricity is to unplug them entirely. So long as the power cord is connected, appliances and electronics are draining energy. You can use a power strip to shut off the electricity to several devices at once, like in entertainment centers. If you do need to leave them plugged in, powering down the device will definitely save more energy than a sleep mode. Set your water heater to 120°F to save energy for heating the water. and insulate your hot water pipes. This reduces energy waste by getting warmer water to the faucets. Using aerators and low-flow shower heads, you can reduce the amount of water, and subsequently energy, being used in your home. When washing dishes or clothes, only run full loads and use colder water settings more often. Programmable thermostats let you set periods of time throughout the day for your heating or cooling to run. This allows you to keep the thermostat off while you are at work or asleep, thus reducing the time you’re AC or heat runs. And since climate control is about half of your energy bill, you’re sure to notice a savings! Green living starts at home. 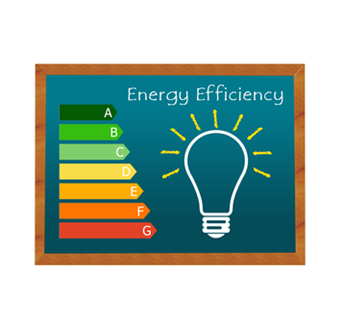 There are plenty of things that one can do to save energy and lower the electricity bills. 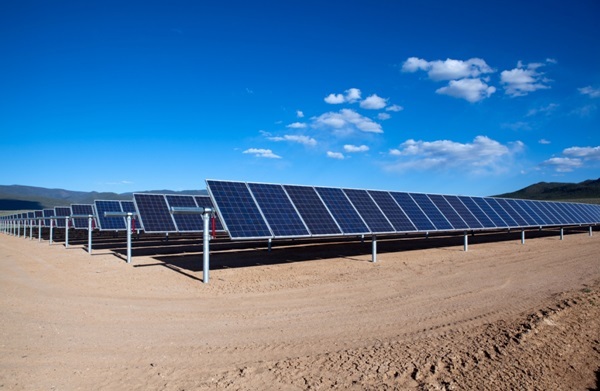 One of the natural ways to get electricity is solar panels. These panels can still generate electricity under light snow fall, but when snow blocks sunshine completely, it becomes a problem for the panels to generate electricity. Generally if the snow melts quickly then there is no worry, but if there is lot of snow it can cause problem. There are ways to combat the said issue. To avoid the snow to remain in the panel, the panels should be arranged in slanting or steep position, which would let the snow fall down or melt more easily and they can deal with harsh climate easily. Snow can be swept off the panels using a garden rake. Snow on the ground reflects and can create more electricity. Solar panels allow snow to melt faster because of the reflection caused. If there is light dusting of the snow, the solar panels lets it melt faster and generates electricity in the normal way. Snow and solar panel can go along together without any problems or issues, if proper care and regular cleaning of the solar panels is done during the winter season. Temperatures are steadily dropping all over the state, which means you’ll be using your AC less often. That can be a very good thing, since climate control in your home equates to about 50% of your energy bill. On the downside, once we get into November and December, we will enter the heating season where we’ll have to start kicking on the furnaces to stay warm. There are a few ways you can prepare your home now so it will be warm and energy efficient later. Perform a home inspection for yourself, looking for areas where air can escape outside. Doors that lead directly outside or even to a garage may have gaps where air can escape. You can close these gaps by Weatherstripping. Weatherstripping uses a material like rubber to help seal the frame of doors and windows. For gaps that formed from a crack in the frame, caulking can be used to seal it. Where possible, inspect the ductwork for your furnace as well. Make sure all segments are securely fixed together and don’t have any leaks. You don’t want to turn the heat on in your home only to warm up the attic. If you have a window air conditioner, take it out and shut the window. Though they can be a hassle to move,they are also a major air leak during the winter. 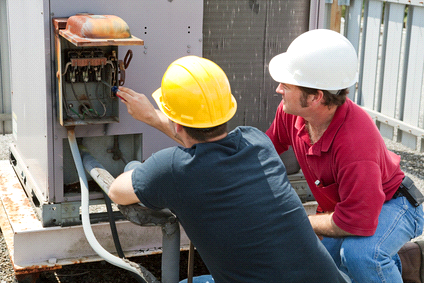 Have your furnace inspected and maintained by a certified technician. Just like maintenance on a car, giving your furnace a tune up will keep it running effectively. Make sure there is no furniture blocking the vents and clean or replace any filters in the system. A dirty filter reduces airflow and keeps you from getting the warm air quickly. Filters should be checked every month and cleaned or replaced when they are dirty or every three months. Installing a programmable thermostat can net you a big savings on your energy bill. They allow you to set the temperatures you want over the course of the day. This means the furnace can be off while you are at work, warm up just before you get home, turn off while you’re asleep, then turn on when you wake up, and repeat the cycle without you needing to do anything. Once the thermostat is set for the times you want, you just leave it in heat mode and let it do its thing. By using these tips, and getting cheap electricity by exercising your power to choose, you can lower your monthly electricity bills and keep your home feeling comfortable all winter long. Don’t be left out in the cold, contact Shop Houston Electricity today to start comparing energy companies and find one that will net you the biggest savings! 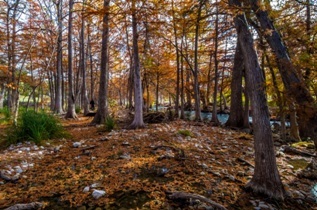 We’ve all heard the phrase “Spring Forward; Fall Back” regarding Daylight Saving Time, but what if you could make the prices on your energy bill “fall back?” This fall, you can do exactly that and make your energy bills fall back into lower rates, allowing you to stay comfortable in these cooler months while saving yourself some electricity and money. Let’s start with temperature control in the home. In this transitional season, you may find that you don’t need to run the heat or the AC at all. If that’s the case, then just leave it off, as that will save you some extra money. To help prepare for the coming colder months, you could consider installing a programmable thermostat to regulate your heat flow in the winter. Programmable thermostats automatically turn your heat or AC on and off at set times during the day. You can program one to remain off while you are at work or asleep, but keep your home comfortable while awake and at home. Cutting back your at-home temperature to a lower setting for the winter month will also conserve energy. Checking your home for air leaks is especially important. It doesn’t matter if your heat is only on while you’re at home if you can’t enjoy it. Gaps in ductwork lose air before it’s even in the room you want to warm up while gaps in window or door frames lose air before a room can be brought up to a comfortable temperature. Weatherstripping your home using caulk or rubberized inserts will prevent this air from escaping and reduce the amount of time your heater needs to run. Speaking of windows, there are special window films that you can apply that actually reduce the amount of heat that escapes through the actual panes. The best part? With recent advancements, these films remain perfectly clear and don’t tint the view outside! You will still retain the same amount of natural light, but you’ll be able to keep the heat inside. Water heaters are constantly running to make sure you have hot water at a moment’s notice. Most factories set the default temperature on these heaters to 140°F, but you can lower that to 120°F and still get hot water on demand. Furthermore, insulating hot water pipes will help them retain heat on their way to the sink or shower, and this will save you from wasting water waiting for it to warm up. Finally, you can really fall into savings by switching to a Houston electric company that offers cheap electricity. Energy rates trend downward around this time of year, so it’s a good time to lock in a low fixed rate plan. Shop Houston Electricity can help you sort through dozens of different companies and plans to find one that fits your budget.